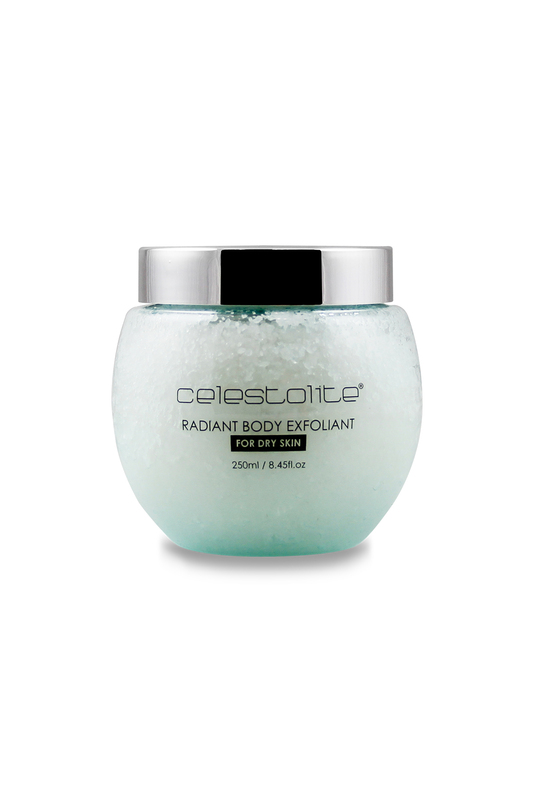 Reveal youthful radiance, smoothing away dull and dry skin with Radiant Body Exfoliant “for dry skin” from Celestolite. This prestigious, spa-like scrub features a unique formulation of botanical body buffers and is rich in skin luminizing oils. Restore lush moisture while gently exfoliating your skin, leaving it feeling silky soft and with a brilliant, age-defying glow. To use, apply liberally to wet skin while showering. Massage in circular motions and rinse clean. Avoid face and neck area. For best results, follow with Revitalizing Body Butter. Sea Salt，Mineral Oil，Fragrance(Parfum), Meteorite Powder, BHT.